Memorial Day marks the unofficial start of summer, and Texans will kick off the season by traveling in near-record numbers. 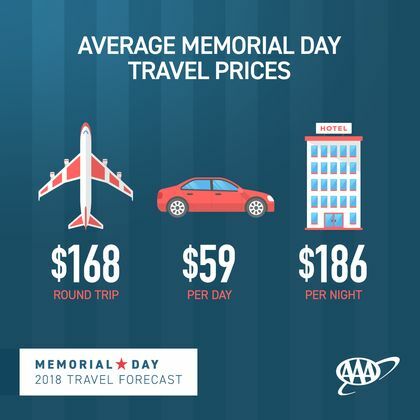 According to AAA, 3.4 million Texans and more than 41.5 million Americans will travel this Memorial Day weekend, nearly 5 percent more than last year and the most in more than a dozen years. With nearly 2 million additional Americans taking to planes, trains, automobiles and other modes of transportation, INRIX, a global transportation analytics company, expects travel delays on major roads could be more than three times longer than normal, with the busiest days being Thursday and Friday (May 24-25) as commuters mix with holiday travelers. Trains, Buses, Rails and Cruise Ships: Travel across these sectors will increase by 2.4 percent to 1.8 million passengers.